How often do you think about lichens? Most people rarely give them a second thought, even though they encounter them every day. Lichens are everywhere — encrusting growths on rocks, walls and tree trunks, more leafy or feathery forms clinging to rocky outcrops and dangling from branches — lichens are among the most fascinating life forms on the planet. Not one organism but two, sometimes three, living together in symbiotic harmony, there’s much more to lichens than initially meets the eye. To look at lichens through a hand lens is to enter a miniature wonderland of astonishing texture, bizarre structure and improbable beauty. But for the budding amateur naturalist let’s face it… lichens are complicated. Lichenologists use chemical tests and microscopes to sort out what’s what in the lab. Lichen identification requires an understanding of basic lichen anatomy, biology and a healthy dollop of not-so-common terminology. To say it’s a challenge would be an understatement – which is probably why I’ve always appreciated lichens, but never had the patience or indeed the confidence to get to know them better. Now though, the wonderful world of Irish lichens has been demystified in a new book by Cork based lichen expert Paul Whelan. In Lichens of Ireland Paul brings many of these remarkable organisms out of the realm the scientist and within easy reach of the lichen novice… in this case me. 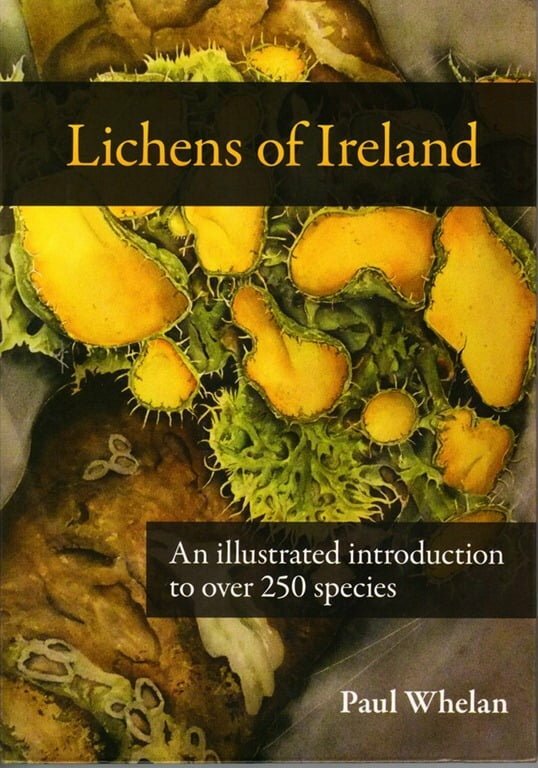 Lichens of Ireland is the first book published specifically on Irish lichens, and introduces more than 250 of the 1,165 species of lichen recorded here. The book kicks off with a broad introduction to the fascinating world of lichens. It explains what lichens are, their various form-factors, important aspects of their biology, the associated terminology and where different types of lichen grow in Ireland. Paul also suggests a practical toolkit that the budding amateur lichenologist can take into the field, and offers a beginner’s guide to identifying and studying lichens. A lot of that sounds terribly scientific, but Paul manages to get the information across in an efficient, matter-of-fact style that’s clear, concise and surprisingly easy to read. The excellent illustrations and beautifully reproduced photographs augment the text perfectly, reinforcing understanding, and breaking up the prose, making the journey from lichen novice to reasonably informed amateur that much less daunting. 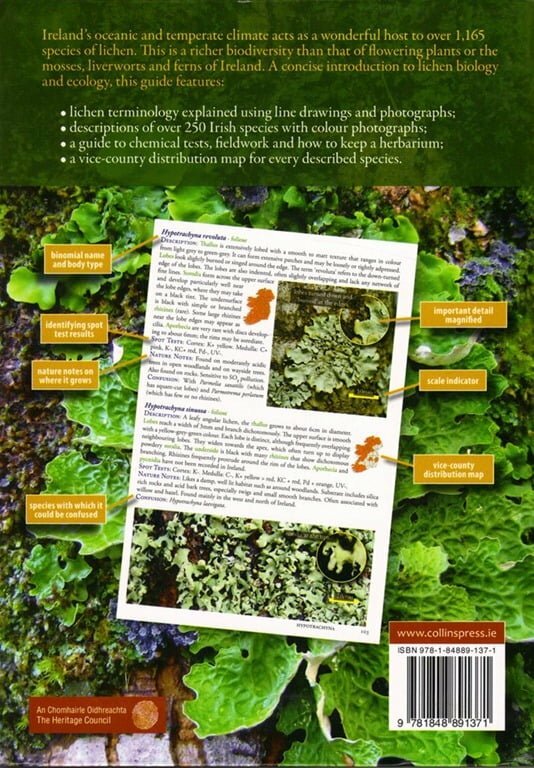 The second part of the book deals with identification of 258 Irish lichens you’re likely to encounter in the field. It provides informative descriptions, superb colour photographs (including magnification of key features where appropriate to assist with ID), and an accurate vice-county level distribution map showing where each species occurs. All of this is crammed into a conveniently slim, lightweight A5-sized guide that can easily be popped in a day-pack or coat pocket and carried with you for a day’s lichen hunting. That’s quite an achievement. There are a couple of caveats though. Firstly there is no identification key – which is essential for truly accurate lichen identification. That’s not an accident: the author points out in the introduction the omission of a key was intentional. 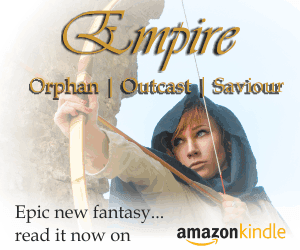 Including one would certainly have pushed the text beyond its intended scope, making it unwieldy and putting off the very audience at which the book is aimed. Once this book gets you started, and you find yourself getting hooked on lichens, you will need a more comprehensive guide with an integrated key. The other question mark I had when browsing the species profiles was the decision to arrange them alphabetically by genus. Alphabetical listings are convenient for looking up a particular species if you already know its name, but they’re not much help for narrowing the field when you’re not sure what you’re looking at (a situation I find myself in all the time). Being able to quickly turn to, for example, a section on the lichens you’re likely to find at the seashore, or in native broadleaf woodland, would make it much easier to hone in on the species you’re after. If, like me, you’ve always wondered about lichens, but never quite taken the plunge let me assure you that they’re certainly worthy of more attention… and this book is the perfect lichen primer to get you started on your Irish lichen adventure. It costs €20 from the Lichens of Ireland Project website, or is available direct from the publisher at the discounted price of €15.99 (at time of writing). You’ll also find it stocked by leading online booksellers and in the natural history section of good bookshops around the country.